I feel like every day starts the same. I wake up with all this inspiration to have a beautiful and productive day, but when it comes down to it, I feel like I'm just spinning my wheels while staying in place. I begin cooking breakfast, and then I notice all the dishes in the sink so I start those, then I notice my dog's water bowl is empty, and while I'm there I see I haven't vacuumed the den in days and the summer coat my dog is shedding is all over the floor. Once I get back to the eggs, they're burnt. Multi-tasking! I'm so guilty of it. I want to get as much done as I can, so I do as much as I can all of the time. I pick up extra tasks while I'm doing other things and then everything ends up taking ALL DAY. Maybe you've seen the video on Facebook of the girl who spent all day starting 100 cleaning tasks, and at the end of the day being exhausted, with nothing done. 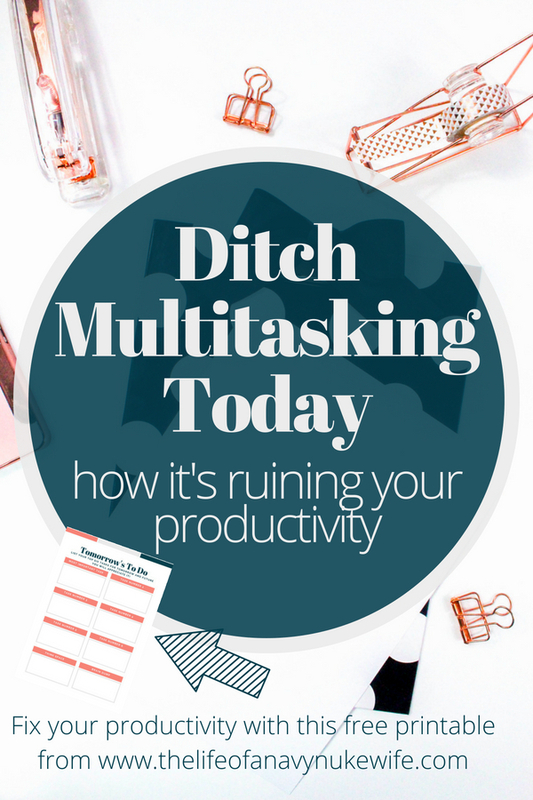 Multitasking makes you feel like you're being productive, but really, you're not doing your best work in any of these tasks, and they're taking much longer to finish. Multitasking spreads your energy and attention, usually too thin. When you're working on one task, you're focusing on the other tasks you're trying to do. How can you fix it? Let's try single tasking! Thanks for visiting us! We use referral (sometimes called affiliate) links to keep this blog running. It costs you nothing, but sometimes gives me a small commission. Thanks for supporting my family! Single tasking, like the name suggests, means focusing on a single task at a time. In the example we just talked about, focus on making breakfast first, and then move on. The way you do this is by minimizing interruptions. You're free to direct your entire attention to the one task, which means you complete it more efficiently. Often, this means the final product is higher quality than it would be when you multitask. Imagine, your eggs could be perfectly cooked instead of trying to scrub the burnt bits off the bottom of the pan. Or imagine actually being able to sit down and spend time with your child reading a book without checking your phone or worrying about the dishes, or what's for dinner tomorrow. Minimizing distractions is easier said than done, however. If you're the type who often checks your phone, even when there's no alert for new messages, you might need to turn it off or keep it in another room. Maybe keep your charger in a certain room, and leave it there, away from you. Similarly, when you log on to your computer, you need to make sure to keep your email closed and stop yourself from opening Facebook or Pinterest in a background tab. There are lots of apps that will help you limit your time on certain Web sites, such as http://offtime.co/, or https://inthemoment.io/. Single tasking may be easier when you know when you'll have a chance to check your email or social media site, however. Studies suggest that taking a short break every 90 minutes help you to be more productive. During those breaks, you can give in to the urge to check all your alerts. Another popular method to increase your productivity is called the Pomodoro Method. This is essentially spending 25 minutes working, then five minutes off. After four 25 minute sessions, you take a longer break. Then continue as need be. One of my favorite productivity tips is writing everything down. I carry a notebook with me everywhere. I don't rely on memory to make sure I finish everything on my to do list. I often use a program called Trello, I can use it on all my devices and it's a great free program for list making. You can organize your things in boards, and have expiration dates, or check lists inside your cards. There is SO much to Trello, you can use it as a stay at home mom, for your work, as a to do list manager, or even as a list for groceries you need. And best of all IT IS FREE. You could upgrade if you wanted, but I have never done so, and I can't imagine a need to anytime in the future. But back to list making! If you take those thoughts out of your brain and put them on paper or into an app, you can focus better on the single task you're trying to do. It helps you stay focused because you won't waste brain space on trying to remember something else. My second favorite way to increase my productivity is to set up my day beforehand. Before I go to sleep, I try to plan out some of what I need to do in the morning. By planning out my most productive time of the day -- when I first wake up -- I can increase the amount I can get done, and prevent myself from spinning my wheels trying to find traction. You can wake up and know exactly what you want to get done, and what single task you should start with. How do you know what to start with? Make a list of six things you need to get done the next day, and then organize them by importance. Starting at the top, do the most important thing first, and when that job is done, move on to the next. I made you a nifty work sheet you can end your day with every evening, grab it below today, so you can be productive now! You may also like Meal Planning Basics!